This book will update and correct remarks Harris has made previously about the Feast of Fools in his book Carnival and Other Christian Festivals: Folk Theology and Folk Performance (University of Texas Press, 2003). As I have argued previously in my masters thesis on Burning Man, and in several posts on this blog, western evangelicalism would do well to reflect on the importance of festival and play in connection with ecclesiology and worship and how the historical Feast of Fools, properly understood in its historical and ecclesiological contexts in the past, might be recontextualized in certain subcultural contexts for the present. For centuries, the Feast of Fools has been condemned and occasionally celebrated as a disorderly, even transgressive Christian festival, in which reveling clergy elected a burlesque Lord of Misrule, presided over the divine office wearing animal masks or women’s clothes, sang obscene songs, swung censers that gave off foul-smelling smoke, played dice at the altar, and otherwise parodied the liturgy of the church. Afterward, they would take to the streets, howling, issuing mock indulgences, hurling manure at bystanders, and staging scurrilous plays. The problem with this popular account—intriguing as it may be— is that it is wrong. 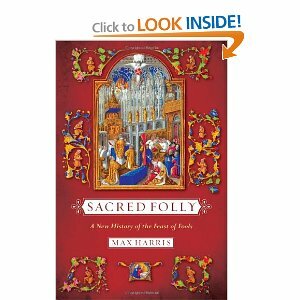 In Sacred Folly Max Harris rewrites the history of the Feast of Fools, showing that it developed in the late twelfth and early thirteenth centuries as an elaborate and orderly liturgy for the day of the Circumcision (1 January)—serving as a dignified alternative to rowdy secular New Year festivities. The intent of the feast was not mockery but thanksgiving for the incarnation of Christ. Prescribed role reversals, in which the lower clergy presided over divine office, recalled Mary’s joyous affirmation that God “has put down the mighty from their seat and exalted the humble.” The “fools” represented those chosen by God for their lowly status. The feast, never widespread, was largely confined to cathedrals and collegiate churches in northern France. In the fifteenth century, high-ranking clergy who relied on rumor rather than firsthand knowledge attacked and eventually suppressed the feast. Eighteenth- and nineteenth-century historians repeatedly misread records of the feast; their erroneous accounts formed a shaky foundation for subsequent understanding of the medieval ritual. By returning to the primary documents, Harris reconstructs a Feast of Fools that is all the more remarkable for being sanctified rather than sacrilegious. Max Harris is Executive Director Emeritus of the Wisconsin Humanities Council, University of Wisconsin–Madison. He has also taught at Yale University and the University of Virginia. He is the author of four previous books, including Carnival and Other Christian Festivals: Folk Theology and Folk Performance and Aztecs, Moors, and Christians: Festivals of Reconquest in Mexico and Spain.